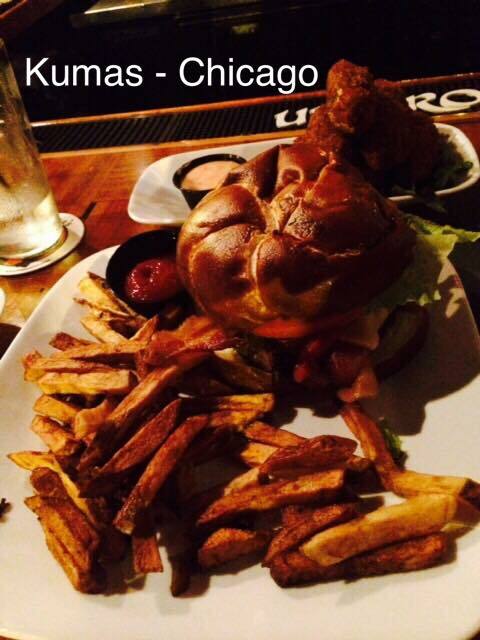 The Original Kumas Corner is in Chicago on West Belmont Ave. It’s a very loud, heavy metal music playing, dive looking place but boy do they know how to make a burger! If I hadn’t heard about this place I would have total driven past it and not given it a second look. In fact I actually did drive past it when I was trying to find it. The crowd outside is what got my attention. If you are in a large party you might as well just plan on not talking to half your friends because the music is concert loud. I just went with my friend Megan and we sat at the bar. This place was packed! 2 hours wait for a table around 8:00 p.m. And it is not very big. We luckily didn’t have to wait that long because the bar seating is first come first serve. The crowd was eclectic and mostly friendly. The Fried Pickles they serve are (at this time) my favorite. I’ve become a Fried Pickle snob of sorts thanks to Kumas. They coat these dill pickle chips with Panko and serve them with Chipotle Mayo. 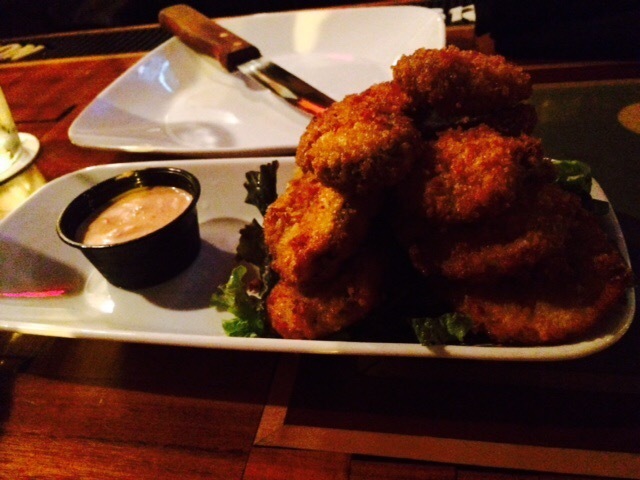 We also tried the Jalapeno Poppers which are also breaded in Panko. And then Stuffed with Chorizo, Cream Cheese and topped with a Balsamic Raspberry dipping sauce. These had more kick than the poppers I order other places. And they were stacked on the plate like a delicious deep fried pyramid. You can see them in the photo behind the burger. We didn’t have room for any other food or I would have tried the mac and cheese. They also have a great draft beer selection. Because what goes with a great burger, right? They do a burger of the month and these are not for the faint of heart. The menu isn’t very big but it doesn’t need to be. Oh, and if you are looking for vegetables there are 2 salads on the menu (A Caeser and a side) but other than the toppings on your burger… that’s about it. There are 4 total locations now including one in Indianapolis which is much closer to me. I can get my Fried pickle fix there. I know I called (the original) a dive but it’s really very nice and I would go back given the chance.